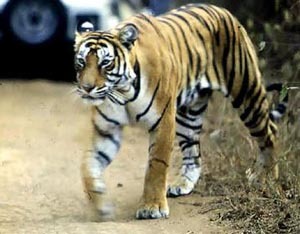 3 Oct : India always on the receiving end of Tiger conservation and protection, has on Saturday announced its decision to draw international attention on the issue by launching 2010 as the “Year of the Tigers’’. The next year on Valentine’s Day, the campaign from Jim Corbett National Park will kick off, according to Environment Minister Jairam Ramesh. India’s offer in this regard was accepted at a meeting held at the prestigious Smithsonian Institute, which was attended by other agencies including the World Bank. “Today India made the offer for launching the Year of the Tiger internationally on February 14, 2010 at Corbett,” Ramesh said, adding the Year of Tiger would end in November 2010 with another tiger consultation in Ranthambore National Park. Ramesh in an interaction with media after the meeting told, “Both these events would showcase what India is doing in the field of tiger conservation.”The Russians are hosting the World Tiger Summit in Vladivostok in September 2010. Noting that all these were meant to establish India’s leadership, Ramesh said 60 per cent of the tigers in the wild in the world are in India.”No country in the world has as extensive conservation program as we have,” said he. Ramesh has however confirmed the World Bank’s (which has started a global tiger initiative) support to te efforts launched by India towards the conservation of the specie which is on the brink of extension. “The President of the World Bank is personally very interested in this project. And today we discussed a possible World Bank support for livelihood security projects in the fringe areas of tiger reserves,” he said. Making a convincing presentation at the meeting, Ramesh said there could not be much progress to protect the tigers, the local communities’ needs to be fully involved in the task of tiger conservation. His ministry would be working on these details, but he has got an initial interest from the World Bank that they would be very keen on supporting such a project. “This would be a very major attempt in creating an incentive structure, which will reduce encroachment on tiger reserve areas,” he said. Noting that the Smithsonian has been training a large number of conservation biologist in India for last many years, he said it is particularly keen on a training program for conservation in our tiger reserves. Phat article, great looking website, added it to my favs! It is an immense pleasure that you had already post to the World Bank groups to launch 2010 as International Year of Tiger for my Awareness Music Academy. However, exactly which is in times I can get this opportunity? So, I humble request you if you give me information details by your renowned dept. Then I will be remaining grateful to you.